The LAKE is a new urban oasis in Southwark: a temporary installation featuring a shallow boating lake (for inflatables and home-made toy boats), a paddling pool, a juice bar and a long timber deck for sunbathing. The LAKE is a place to go on holiday in your own city, in your own neighbourhood. It’s a place to see old faces and meet new ones: neighbours, Londoners, visitors from around Britain and abroad. For more information visit The Lake website. 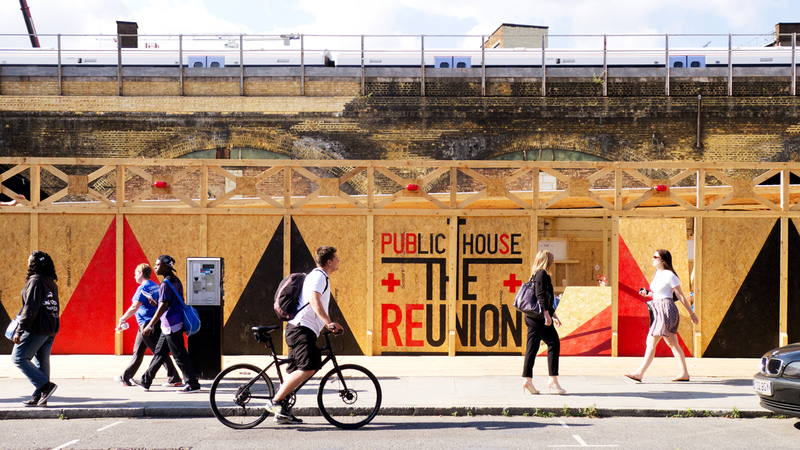 The reUNION was a temporary Public House, in the spirit of the 1830 Beer Act in which anyone could apply for a licence and open up their front room to the public, to sell – and even brew – beer from their own home. As EXYZT inhabit and build their own installations, it seemed fitting to re-examine together the idea of a house open to the public. For more information visit the reUNION website. The Southwark Lido was a temporary, free public Lido created as part of the London Festival of Architecture 2008. Following in the tradition of Roman baths and Turkish hammams, which provided a setting for social gathering, ritual cleansing and uninhibited political discussions, the Southwark Lido was a breathing and bathing space in the heart of a bustling city. For more information visit the Southwark Lido website. In collaboration with Pankof Bank. 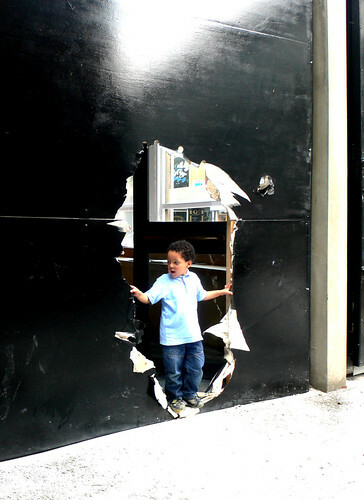 The Architecture Foundation’s Yard Gallery is set in the densest part of Britain’s architectural community, the epicentre of where our cities, buildings and public spaces are designed. On June 1st a new architecture practice will take over the gallery for ten days, lead by Pankof Bank in collaboration with artist Sara Muzio. Whilst the space uses the language and physical structure of a corporate architecture office housing all the usual facilities – internet, printers, photocopiers, coffee makers – this will be no ordinary architecture office. 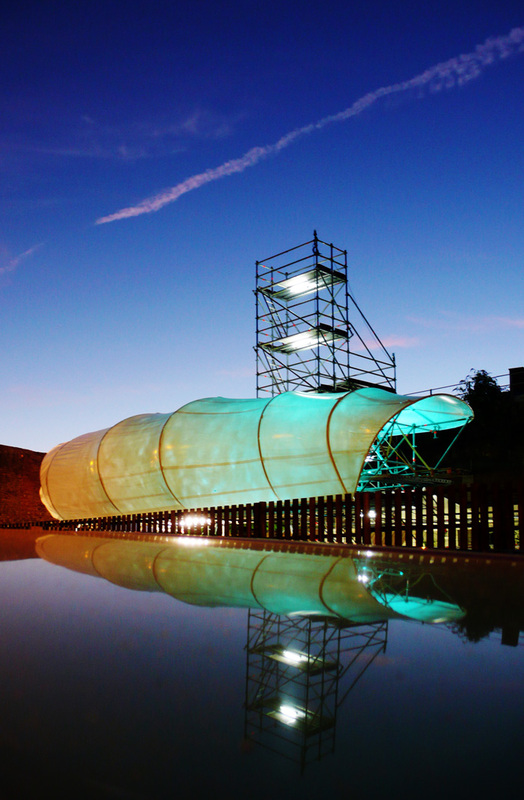 It will be open to the public and all facilities will be free for use by anyone, every day. Visitors will be invited to set up their own work-space using the wireless network, watch films from the office archive or eat lunch and read from the library. 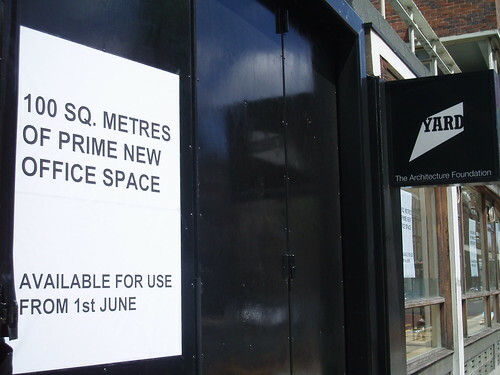 Rather than a private office domain, the space represents a new kind of productive public space; a place to examine today’s city in the face of the rapid privatisation of the public realm. For ten days, the ‘architects’ will cook, eat, sleep and shower in the office with self-made living constructions, they will also document the life of the office as a hive of human interaction in an increasingly sanitised and controlled city. 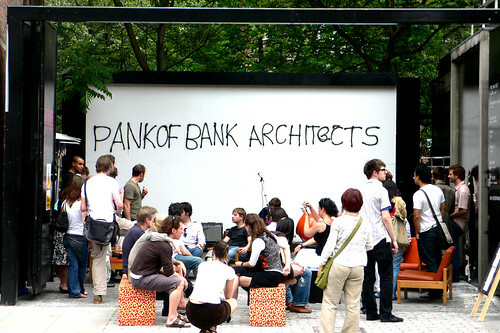 For more information visit the Pankof Bank Architects page.